Can you just substitute one for the other? For voters across Toronto, as well as those living on the steppes of Ward 2, the apparent promise at the centre of the Ford family’s dramatic and arrogant switcheroo operation is the notion that any one of them is just like the others. Doug Sr., Rob, Doug Jr., Michael — it doesn’t matter who holds office. What’s important is that the values they claim to espouse — small government, low taxes, private sector service delivery — are basically interchangeable. The given name is unimportant. The brand promise lies in that surname: Ford. If the idea seems vaguely familiar, that’s because it’s the operating principle behind the fast food industry. What the chains have told consumers for decades is this: no matter where you are in the world, that Big Mac is going to taste the same. I suspect the Fords, to the extent that they think about such things, probably do see themselves in this way, what with being business people who know they must deliver a highly standardized, manufactured product. But the real and far more disturbing subtext behind yesterday’s remarkable maneuver is that this family — for all its populist, working-class posturing — evidently regards northern Etobicoke, and even the city itself, in feudal categories. The message in that three-way swap was this: their political authority is inherited, as opposed to earned, and their ancestral turf must be defended at all costs. The very definition of political elite-ness. There’s much to suggest that this mindset is very much alive in the family. The Fords have behaved for years as if they are above not just the law, but collectively established norms for political behaviour, as well as policies governing a broad range of council’s decision-making process. They expect obedience from others but do not — will not — submit to externally imposed authority. 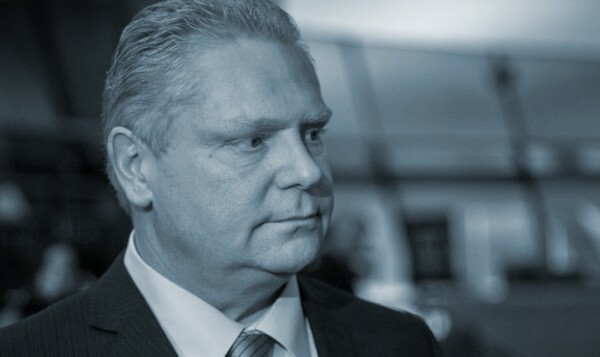 The irony, of course, is that the Fords’ deluded sense of manifest destiny — and their ambition to retain political control at all costs — will likely be destroyed by Doug’s abrasive, dishonest public persona. Amazing as it is to commit to print, Rob, as an individual, remains a far more compelling public figure than his brother, and this despite an encyclopedic collection of flaws, including many truly odious personality disorders. For all his emoting yesterday when he formally announced his candidacy in a teary press conference at the family compound, Doug mostly comes across as something of a Shakespearean villain in this drama — he glowers, he schemes, he bullies, and he quite consciously seeks to intimidate. When Doug arrived to City Hall, back in 2010, people said, “oh, Doug is the smart brother, the one who took the family business to the next level, and who hadn’t brought shame upon the old man,” et cetera, et cetera. But the Doug who now dutifully seeks to succeed his ailing brother as mayor — who, perhaps with his mother’s blessing, finally has a chance to grab a prize he has surely coveted for these past four years — is an obviously narcissistic figure with far less purchase on the hearts of voters, even true believers. It’s also noteworthy that the members of this family have somehow persuaded themselves that it’s more important to hold power it is than to support Rob’s recovery, or at minimum urge him to rest instead of waging a political campaign from his sick bed. It’s like a really bad soap opera. How will voters react to all this Dallas-style melodrama? I’m guessing many card-carrying Rob Ford supporters will balk at the presumptuousness of Doug’s gambit, and recognize his teary-eyed, selfless decision to run for what it is: a nakedly ambitious power grab by a guy who’s been telling voters for months that he’s looking forward to getting away from the snake pit that is City Hall. Doug, ultimately, is hardly his brother’s ideological doppelganger. For all his flaws, Rob managed to communicate real sentiment to thousands of voters who were prepared to forgive his failures and dissembling because he seemed to genuinely care about their problems. Doug — the guy who deliberately exposed his brother to weeks of ridicule during their weight loss challenge — has none of that, and indeed never bothered to cultivate that kind of affection among voters. Rather, he’s the guy who tossed $20 bills at the poor children of the housing projects, as if to say, go buy yourself some cake. Great article overall, fantastic incisive analysis and exposure of the insidious powerplay we all got sucked into. BUT, the article seems to make Rob look good vis-a-vis Rob with statements like ” communicate real sentiment to thousands of voters who were prepared to forgive his failures and dissembling because he seemed to genuinely care about their problems.” Really? They’re both horrible bullies that have railroaded over Torontonians, humiliated us and crossed every line of public decency. So, I feel like yet again, journalists and the media have been strung along in the big Ford game by now all of a sudden vilifying Doug to make Rob look good and in doing so, bolstering his every-man image, ailing-from-sickness halo and voter likeability!!!! I can’t believe the stupidity of this type of article. First of all, Lorinc if you want to run for mayor run for mayor – you have the same right and opportunity as any other Torontonian. And many Torontonian have, from wacknut 1- 50, serious and semi-serious contenders and now Doug Ford. I have far more respect for those who participate, than those that would whine about someone they don’t like running. And to pretend that families have not been a part of politics is idiotic. Father to son, father to daughter, husband to wife… example after example – feudalism – no it is democracy. And in fairness to Ford it was he that challenged many policies that promoted incumbent advantage, bloated Councillor budgets that allowed for “donations” for community groups, Section 37 contributions for vote buying goodies, and proposals to shorten lawn sign periods limiting candidate opportunity to gain name recognition. Doug Ford registered his mayoral candidacy web site on May 6. Hey Harold was it not the Fords who tried to initiate “their way or the highway” thumbs up and down threats in Council, who name called and questioned the personal integrity of basically everybody who crossed their path, threatened to sue as a way of silencing critics? Who complain about government but want all their family to be in it and feel they can trade places with entitled impunity? Yeah they are real champions of democracy. Ford Nation suffers from “Stockholm Syndrome”. They will vote for any Ford to please them, even if they end up suffering under them. Speaking of feudal, will you be voting for Trudeau? Or rooting for Hillary? Harold, I can’t believe the stupidity of this type of comment. First of all, Harold if you want to write a column write a column – you have the same right and opportunity as any other Torontonian. And many Torontonian have, from wacknut 1- 50, serious and semi-serious columnists and now John Lorinc. I have far more respect for those who write columns, than those that would whine about someone they don’t like writing a column. Again scottd I miss your point. You could have run for mayor. Their Mom could have run for mayor, the niece who played football could have run for mayor. That is how it works. I can’t understand why you sense there is something entitled with Doug running for mayor. You don’t seem to know much about elections, so here is a tip: it seems like you don’t like him, so vote for someone else. I did not like Rob Ford as Mayor and any time someone suggests that he is folksy or jolly, I think about the Daniel Dale incident. Any doubt that he was an uninformed, misguided but nice Buffoon was wiped out by what he did to Daniel Dale. He is every bit as much a Black Heart as Doug. However, having said that I do feel sorry for Rob on two counts. First his dread disease and second having Doug as a bully and brother.